of the Finger Lakes, Rochester, and Ithaca, NY. Over the years we've found that our companions invariably have a smile on their face as they exit a gully. The smile is so predictable that we wanted to label the phenomenon. We've called it the "grin factor." After two or three successful waterfall hikes we are confident you will come to understand the meaning of the "grin factor" and perhaps you will become curious like we did and ask, "Why?" Why does waterfall hiking have such a consistent effect on the mood of the hiker? 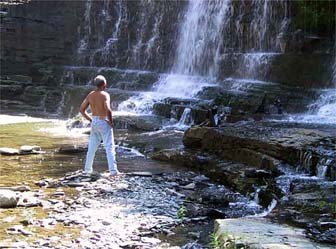 Other types of hikes can have the same effect but it is not as consistent as the effect from waterfall hiking. 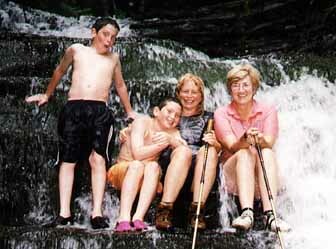 We began to ask what factors may be different in waterfall hikes than in other hikes?" Eventually one of our fellow hikers remembered reading about the "negative ion" phenomenon caused by falling water. Simply put, some scientists assert that the change in the balance between negative and positive ions in the air around you can elevate your mood. Research indicates that the additional negative ions can have a stimulating effect on the production of serontonin in our brain, and with more serotonin our moods improve. Several internet and library inquiries produced additional information about negative ions which we include below. We know there is a good deal more research on this subject, some of it quite technical. We've included what we've found and invite you to let us know where further information can be located by sending us feedback. Soyka, Fred, "THE ION EFFECT", E.P.Dutton & Co., Inc.,New York, l977. Contains many discussions on the effects of negative ions on the human body. An entire book devoted to the effects of ions. Zamm, Alfred V., "WHY YOUR HOUSE MAY ENDANGER YOUR HEALTH", Simon and Shuster, l980, Chapter 4 . This book discusses various research on the effects of negative ions on the human body. Michael J. Norden, M.D. , "BEYOND PROZAC". Regan Books, Harper Collins Publisher, l995, Chapter 8. Discusses known information about the effects of positive and negative ions on the human body and mood. No doubt about the grins above! We presume that the waterfall lover below will also be grinning when he comes out of his deep meditative trance. We welcome additional references on this topic, supportive or otherwise.